What do these stories have in common? They illustrate how small children pick up on nutrition messages and words, and while they may seem to understand, in general they don’t. It doesn’t help their eating to try to use nutrition messaging as a way to get them to eat more or different foods. It’s another form of pressure. Ask yourself, why am I using these words? If the answer is to get him to eat something, or entice him, it will probably backfire, especially for children who really want to “do it myself!” or who are sensitive and turned off by any agenda around eating— which is the case for many children with extreme picky eating. 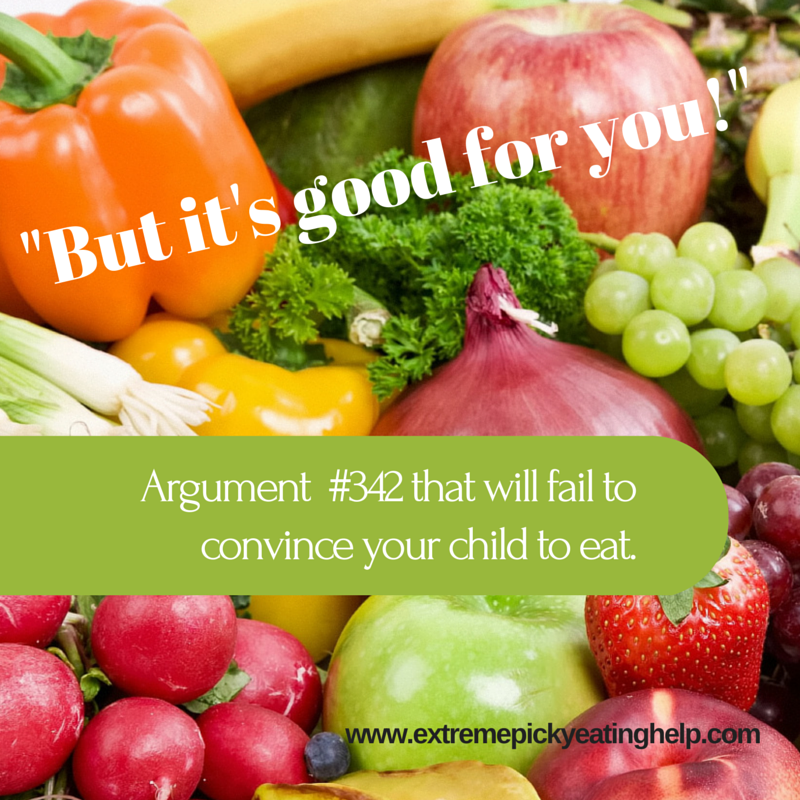 It’s tempting to try to rationally explain to your child why eating a variety of foods is a good thing. But extreme picky eating is not something you can rationalize, explain, or educate away. Talk can also backfire in unintended ways for children with anxiety, which often goes along with extreme picky eating. Like the mom whose anxious selective eater refused to eat anything not organic because it was “full of pesticides that will give me cancer.” Or my coauthor’s son who for months asked at every meal about salt content after a teacher instructed the then-preschoolers to avoid too much sodium. If you choose to feed your child organic foods, or foods free from artificial dyes or other preservatives, being aware of the words you use can prevent unintended anxiety and rejection of foods. We offer the idea that if you’ve been encouraging your child to eat using nutrition talk and it’s not working, you can abandon it altogether. It’s often just more noise that gets in the way of your child being able to tune in to signals from his body about hunger, appetite, and curiosity around new foods. And remember, when in doubt, the less you say, the less they will find to argue against, negotiate or resist. *We think words are so important, that our book, Helping Your Child with Extreme Picky Eating includes dozens of suggested words and “scripts” you can adapt to your situation in the heat of the moment.